The Ross-on-Wye Flood Alleviation scheme is a £7m project, funded by DEFRA, designed to provide a 1% (1 in 100) annual probability of flooding to the low lying areas of the town due to the extra water being brought in by the Rudhall and Chatterley1 Brooks after heavy rain fall. This scheme will protect the lower areas of the town from a repeat of the severe flooding which occurred in December 2000. HERE are photos of the Brookend floods in 2006. HERE are some more recent photos of the Wye in flood. HERE are some historical views of the Wye in flood. The aim is to increase the volume of water that can pass through the town using a culvert and limit the amount of water that is allowed into the water courses. What areas are to be protected? It has also to be acknowledged that Brookend Street also suffers due to surface and foul water but this is being dealt with under another scheme. The main areas affected will be the Homs Road car park, Kings Acre car park and the area to the east of the A40. This will close the Homs Road car park and the lower level of the Kings Acre car park. The work was initially due to start in spring 2006, but was delayed after government funding difficulties. It is now scheduled to start in September 2007 and be completed by July 2008. A 2.1 metre diameter, 350 metre long, tunnel/culvert will be built from the Kings Acre to Homs Road car parks. This will form an inverted syphon with a falling shaft in the area of the Kings Acre car park and a rising shaft in the Homs Road car park. This will be built into the sandstone bedrock with a concrete liner. This will divert some of the water from the existing Greytree Road culvert and thus greatly increase the amount of water that the water course can carry. There will be general improvements in the area of the Ropewalk to open up the waterway so that it can carry the higher flows. Along the line of the Chatterley Brook1, a large culvert will be built will be built below the railway embankment and the water courses opened up in the Broadmeadows areas. To the east of the A40, the banks will be reinforced and a controlled spillway will be added. This will be fed from the 1.7m high bund, which will create a water storage area at times of high flow. HERE are photos of the ongoing works in 2008. HERE are photos of the works starting and carrying on through 2007. The picture above is of the top of a million litre (or gallon?) tank that sits under the Homs Road car park. 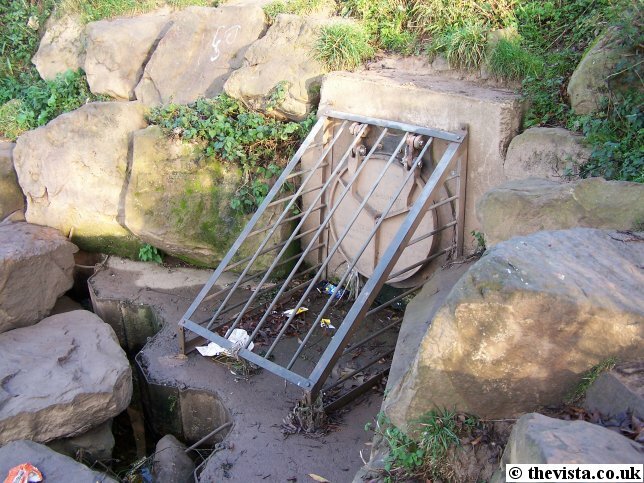 This was built to hold back flood water when flooding occurred and the water could not run away. The water is then pumped out to the water treatment plant, which is to the south of Ross, or overflows via a pipe out to the river where it exits through the check valve shown to the left. Interestingly, one bystander said they watched it being built. The pipe was bedded onto river pebbles and each of the sections were fitted together with rubber seals. These seals were badly fitted and failed during pressure testing whilst the scheme was being commissioned. As a result, after it was first laid, the pipe had to be dug up again. This turned the area into a mire making the job even harder. The seals were then replaced and the pipe buried again to give what is there today. 1 The brook referred to as the Chatterley Brook is actually a unnamed brook that flows from Weston-under-Penyard past Chackley Grove. It has only recently become referred to as the Chatterley Brook and locally it was previously known as Chackley Brook.